After our latest titanosaur entry and a week off, here's... another sauropod. This one's different though: it comes from early on in the history of sauropods, and shines a light on the early diversification of the group. I introduce Lingwulong shenqi, debuting as the world's oldest known dicraeosaurid at somewhere around 175 million years old, and the first substantiated dicraeosaurid from Asia. These "oldests" and "firsts" are more important than they might sound. Aeolosaurus is one of those dinosaurs that is referenced fairly often in the literature, but has not left a strong impression with non-specialists, kind of like a character actor who's appeared in dozens of movies and TV shows over the years. The name rings a bell, but it's hard to recall much detail. It's easily the least familiar dinosaur to have both a namesake clade (Aeolosauridae/Aeolosaurinae/Aeolosaurini, depending on your taste, with the last being the most commonly used) and three valid species. It's not Aeolosaurus's fault, after all, unless you want to blame it for its habit of bequeathing only bits of tails to posterity. If you saw one amble by, you would definitely remember it. 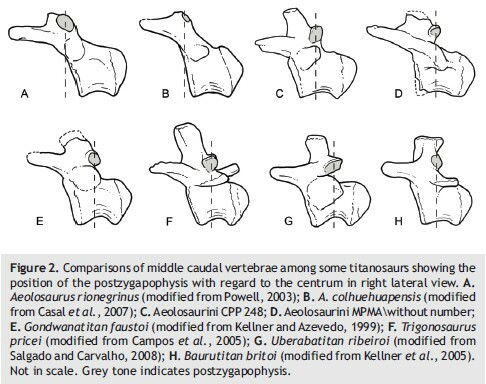 Caudals from several aeolosaurinids (A–E) and other titanosaurs, from Martinelli et al. (2011), showing how the neural arch and its processes are shifted to the anterior end of the centrum. 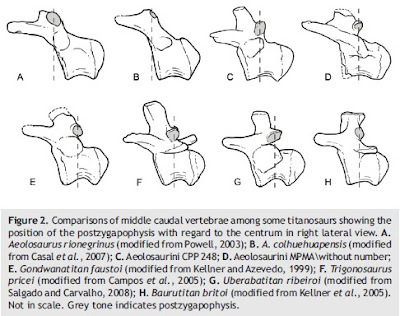 It also shows the procoelous nature of titanosaurian caudals, a style of ball-and-socket articulation with the socket in front and ball in back. In Aeolosaurus this is not a perfect ball, but skewed dorsally. Anterior is left and posterior is right, in case you need the orientation. "MPMA\without number" is actually part of the holotype of Aeolosaurus maximus, so all three named species are supposedly included, but the specimen labeled here as "MPMA\without number" actually appears to be CPP 248 (supposedly C) per an earlier figure in the publication. Could C and D be mixed up? Fun with nautiloids: an essay in futility? Or: "What good is a seven-foot nautiloid?" In most reconstructions of marine Paleozoic life, large orthoconic (straight-shelled nautiloids) get two jobs: they are either large menacing objects in the water, usually seizing some unfortunate trilobite; or they are parked on the seafloor, again often engaged with a trilobite. The general takeaway is that a giant nautiloid was a voracious predator. Trilobites presumably are selected as the prey because so few other animals that lived during the heyday of the giant nautiloids both moved under their own power and were bigger than a few inches, making them about the only group worthy of the honor of artistic predation (although we can guess that a not-insignificant part of a giant predatory nautiloid's diet would be smaller nautiloids). 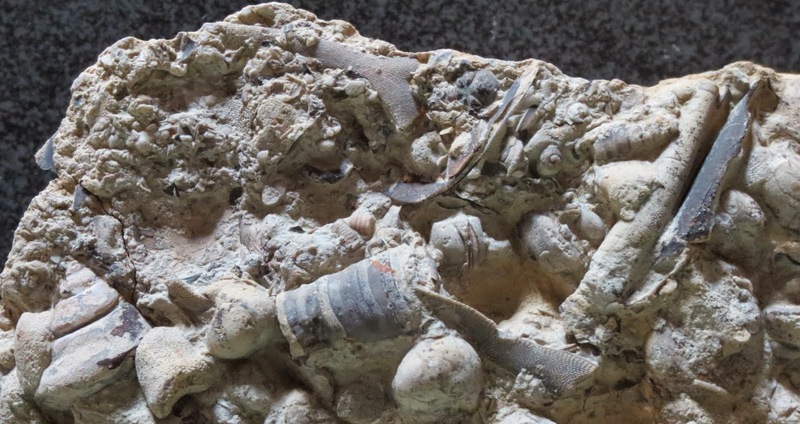 Another, less scientific reason for having a nautiloid capture a trilobite is that otherwise Paleozoic marine reconstructions would be a whole lot of small filter-feeding animals not going anywhere, which doesn't make for dramatic art. Nautiloids and trilobites: natural enemies forever locked in combat. Also pictured: many snails. Last year for Fourth of July week I put up a post on dinosaurs of the National Park Service. With the same time of year upon us, I thought I'd try something similar. Now, we haven't had all that much change in NPS dinosaurs over the past year, but there's something else that's even more appropriate: bison. Cue the map! 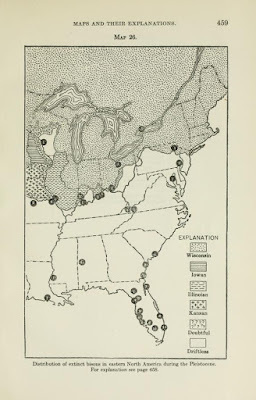 For this map, parks with paleontological materials of bison are indicated, with two questionable occurrences (18 and 32) represented by gray question marks. See text for caveats. 1. Lava Beds National Monument; 2. Golden Gate National Recreation Area; Santa Monica Mountains NRA; Joshua Tree National Park; 5. Nez Perce National Historical Park; 6. Craters of the Moon National Monument & Preserve; 7. Yellowstone NP; 8. Fossil Butte NP; 9. Timpanogos Cave NM; 10. Arches NP; 11. Glen Canyon NRA; 12. Zion NP; 13. Tule Springs Fossil Beds NM; 14. Lake Mead NRA; 15. Grand Canyon NP; 16. Great Sand Dunes NP & Preserve; 17. Chaco Culture NHP; 18. Gila Cliff Dwellings NM; 19. White Sands NM; 20. Bering Land Bridge National Preserve; 21. Yukon-Charley Rivers National Preserve; 22. Denali NP & Preserve; 23. Theodore Roosevelt NP; 24. Wind Cave NP; 25. Badlands NP; 26. Missouri National Recreational River; 27. Tallgrass Prairie National Preserve; 28. Lake Meredith NRA and possibly Alibates Flint Quarries NM; 29. Waco Mammoth NM; 30. Padre Island National Seashore; 31. Ice Age National Scientific Reserve (affiliated); 32. Valley Forge NHP. For bison, I'm not quite as confident with my records as I am for, say, mammoths or sloths or dinosaurs. In large part this is because bison are relative latecomers to North America and their record goes to the present. If you've got a random mammoth bone, nobody's going to blink an eye if you call it "Pleistocene", but a random bison bone is not so indicative. 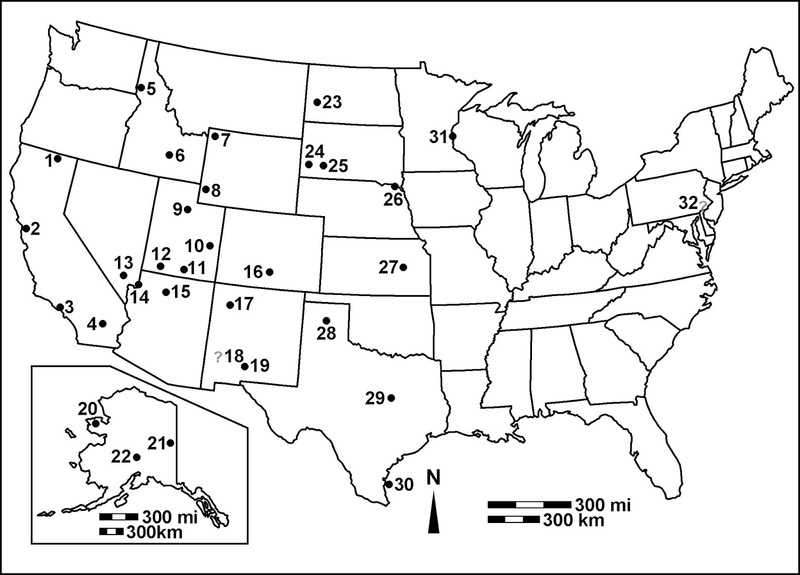 There are probably isolated occurrences of fossil material that I don't know about because they've been classified as recent or not classified at all. In addition, some researchers are strict about not considering specimens paleontological if they are more recent than a certain age, whereas I am not so strict about the Holocene. (Of course, then you get into the overlap with archeology.) Therefore, the list I have is subject to change. 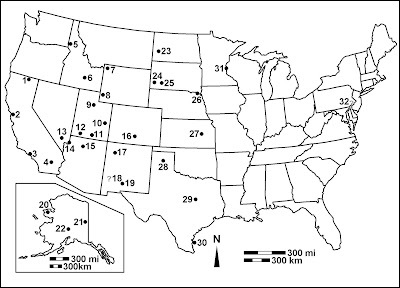 At this time, perhaps the most notable occurrence from these 32 parks is an early Holocene bison bonebed found in the Wisconsin side of Interstate State Park, one of the units of affiliated Ice Age National Scientific Reserve (I plan to cover it in more detail at another time). 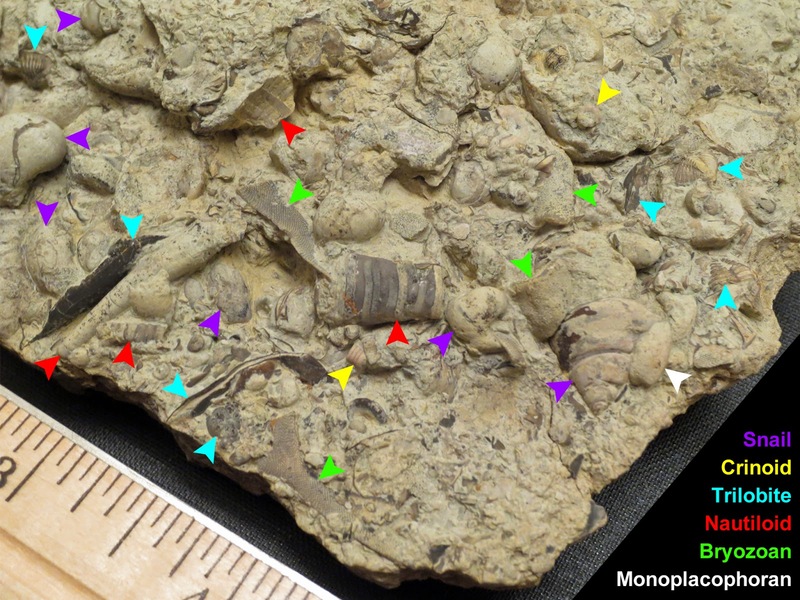 Otherwise, the record of NPS fossil bison is mostly isolated, incomplete material, with some bison dung in cave settings. Distribution is dominated by parks west of the Mississippi, particularly those larger than a few hundred acres. There are some not currently listed, such as Big Bend NP, Death Valley NP, and Glacier NP, that would not surprise me if they eventually are added. East of the Mississippi we don't have as many large parks, and there's a definite tendency for large mammal records to come from caves, so I would expect to add some of the parks with caves over time. Or maybe I should look at some of the coastal parks. 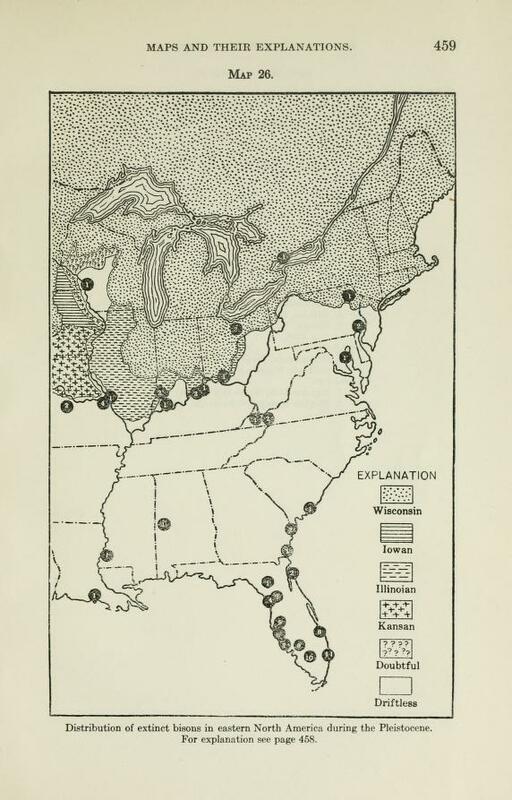 From O. P. Hay's 1923 catalog of eastern North American Pleistocene finds (extant B. bison gets the next map in the volume). One of the things you will encounter with the genus Bison in North America is the usual complicated taxonomy. The exact timing of the arrival of Bison in North America is not certain, but bison were established by at least 160,000 years ago. Bison arrived as Bison priscus, the widespread Steppe bison, which was not unlike the modern bison. 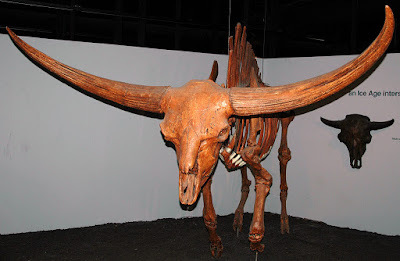 B. priscus evolved into B. latifrons, which can be distinguished by its large size and enormous horns, and B. antiquus, which was not quite so large nor extravagantly equipped with horns. For B. latifrons, there was never such a thing as having too much horn. Cincinnati Museum of Natural History & Science mount, photo by James St. John via Wikimedia Commons. B. latifrons went out of the picture during the most recent Ice Age (a unique sense of timing compared to all of the species that went extinct right after), but B. antiquus was still there to carry the bison banner. 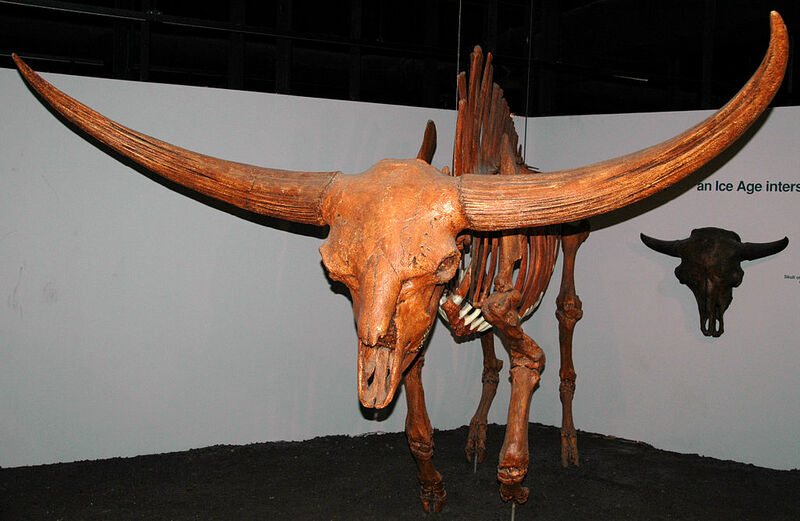 B. antiquus in turn evolved into the yet smaller B. bison in the early Holocene, about 10,000 years ago. The transitional phase is sometimes described as another species (or subspecies), B. occidentalis. 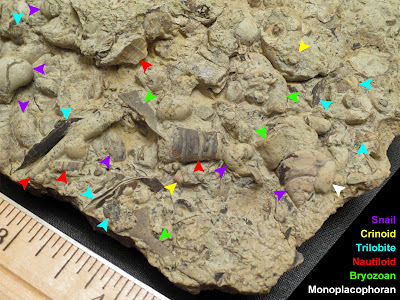 We ran into B. occidentalis way back in early 2014 on I-35E, and this is also the form that has been identified at the Interstate State Park bonebed. A regularly updated, searchable, and sortable directory of basic information on published species of nonavian dinosaurs, pterosaurs, choristoderes, placodonts, basal sauropterygians, and plesiosaurs (separate sheets). Other groups to be added over time. I am a researcher and writer who has been helping to inventory and catalog the fossil resources of the National Park Service.